Preheat your oven to 250C (very hot). Combine the dry ingredient, egg and milk and whisk well. Add the water, chocolate and Cointreau and whisk until combined and you have a thin batter. Allow to sit for 10 mins. Grease two medium ramkins with butter, then place 1 Tablespoon of butter in each ramkin and place in the oven. When the butter is all melted and just starting to smoke, remove from the oven and pour 1/4 of the batter in each of the ramkins. Slice the strawberries into three, and lay the slices on the batter. Return the ramkins to the oven and bake for 10 mins, at which time, reduce the oven temp. to 180C and bake for a further 10 mins. 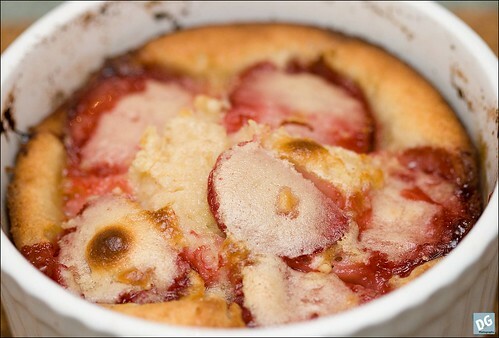 Allow to cool slightly (until the edges come away), then remove the puddings and serve with ice-cream.